The ultimate blend of handling ride and refinement can only be achieved by a dedicated suspension specialist like APEX, who have gained extensive knowledge from a combination of in-house test and development engineers, test drivers and racing experience. All kits are extensively tested and carry TUV approval. Supplied as a boxed car set, and guaranteed to improve the handling and looks of your car with a lifetime warranty. 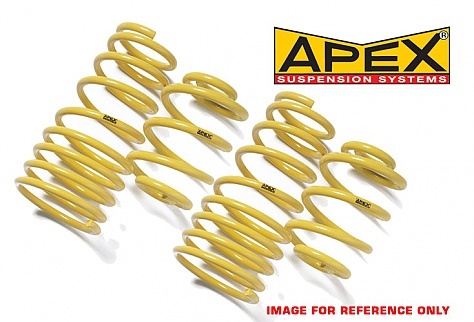 Apex springs are a great replacement for the standard springs on your vehicle. They will usually lower the vehicle by 30-40mm which will not damage your standard shock absorbers. This will not only improve your vehicles handling, response and grip, but will add that extra touch of style that will make your car look different from the rest. The ride will be a little firmer, but never too harsh.